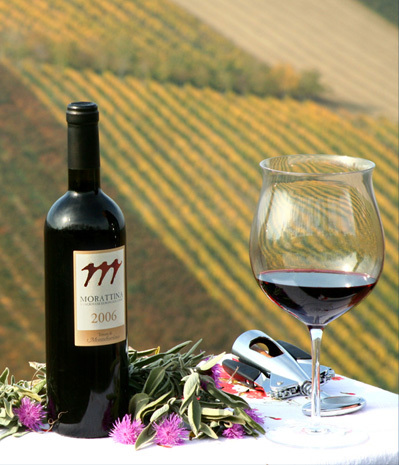 The wine-growing estate Montefortino is situated on the ridge of the Appenine mountains, where once the castle Montis Fortini stood. The estate consists in its entirety of seven harmonically placed cottages, which together form a natural oasis. The elegant guest rooms in the cottages overlook the hills of Faenza, which is, as all the other villages in the area, rich and attractive – Brisighella, Castrocaro Terme, Torre di Monte Poggiolo and Torre d’Oriolo dei Fichi are just some kilometre away. The estate and the surrounding area with its vineyards and fields form a unique symbiosis, which protects both tradition and countryside. An integrated redevelopment project allows us to provide the guests with high quality local produce. Over the past four years remarkable investments have taken place to build the new facilities of the wine-growing estate and to bring forward the ambitious projects of wine growing whilst protecting the environment. Vineyards: 8 hectares with the grape varieties of Sangiovese, Merlot, Cabernet Sauvignon Rosso, Sauvignon Blanc, Chardonnay, Petit Verdot with free cordons and a plantation spacing of 2,50x0, 75, which equates to 5,333 plants per hectare. Olive groves: 2 hectares of the olive varieties Brisighella and Ghiacciolo for a dense cultivation for the high-quality production of the olive oil Brisighello DOP. 3 hectares for the organic cultivation of different herbs, such as lavender, melissa, st john’s wort and sage, for the production of essential oils.